Isn't sale pricing the antithesis of branding? What we charged you before wasn’t what our stuff was really worth. Now, I know that there's no merchandise theory of value like Marx once postulated underwrote the sweat equity of labor, but CAGR is an approximate measure of at least a core cost for products and services. Add up the expenses of gruel, lead paint, and large shipping containers, and you've got a base price for most toys sold this year. Oh, and don't forget the cost of all that glossy branding, and anything else that can be legally, if not wholly credibly, attributed to requirements for getting "on shelf." So Brand Name X costs Y. Got it. I might not like it, or agree with (or understand) the calculation, but I acknowledge it. Price/benefits = value. It's only when you get into the complicated dance routine of supply vs. demand that the picture gets all out of whack. Christmas, being the biggest gift-giving moment for the largest number of people in the Western World, creates a natural deadline: prior to December 25th, consumers need to buy things, so demand should push prices up. With that pressure relieved Christmas morning, prices can fall, as few shoppers are thinking ahead 364 days. Now, think of that switch on any given day, as any business changes pricing. Maybe it's prompted by some complicated computer model identifying the optimum pain consumers will endure at any given moment. Or perhaps it's because the store manager saw too much stuff gathering dust on the front table. If the worth of stuff can change within days -- and sometimes quite dramatically, as a review of sale offers in today’s newspaper attests -- how does brand stay constant? Branding absolutists will say that we're talking apples and oranges. Brand equals emotional, associative, social, and then, perhaps lastly, functional benefits, while price is quite literally the ever-shifting cost for acquiring those benefits. Sure, they correlate -- I can't sell a Hyundai for the price of a Lexus -- but people engage primarily with brands in a way irrespective of place, time and, generally, cost. Putting a brand on sale means consumers can get all those same benefits for a lesser price. Sales are broadstroke CRM, or blunt, mass-media rewards for people who desire one brand or another. I say that such reasoning is illogical. Consumer experiences of brands are inexorably woven within situational and behavioral details of space and time...i.e., experience isn't with brands as much as by, among, because, thereupon, with, and resulting from them. The context of reality is far more important that imagined position of brand. Businesses know it picking prices, whether MSRP or sale. So do consumers, when they learn to play the sale game. Slashing prices the day after Christmas is a ritual, really, for which consumers plan, and the gash between "list" and "actual" cost is likely to be severe. 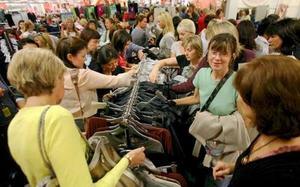 The half-life of any apparel pricing, especially women's fashion, is shorter, too. And we're seeing that technology products don't age well, mostly, and car models change prices almost as often as the wind changes direction. With any number of bloggers, chatters, and Internet sites ready to remember, track, and predict these patterns, you'd have to be willfully blind to its implications for valuations of brands. Because, as retailers try to make up with sale items all the sales they were unable to realize with regular pricing, they’re daring consumers to revalue what they're buying. The greater the pricing variability, the less qualities of brand have any inherent value. Something that costs less due to the exigencies of sellers can never fully be worth more when it comes to the needs of buyers. Sales are a chronic affliction for businesses, and a constant reminder to consumers that all the imagined promises of branding don't necessarily connect to the reality of prices. This week's sales aren't price discounts; they're proof that efforts to sell stuff the remainder of the year will be attempted at inflated prices. OK, I get it, I think, before Christmas the prices are high because the demand is high and after Christmas the demand falls so the price will follow down. But wait, this year in my local area, and nationwide I think, a lot of sales started before Christmas. I assume that a lot of companies are just canabalising their own after Christmas sales to push up their turnover, or maybe they feel they have to do it because their customers are doing it. I wonder how long it will be before the January sales start in November. It seems I don't get it after all.